A federal judge in Seattle sentences Ressam to 22 years in prison. Prosecutors were seeking a 35-year term after Ressam refused to co-operate in the conviction of two co-conspirators. A deal with prosecutors would have put Ressam in prison for 27 years. Defence lawyers asked for a 12½-year sentence, saying Ressam has denounced extremism and aided investigators. Ahmed Ressam's sentencing is delayed once again. After 2� hours of arguments, a judge agrees to postpone the sentencing hearing until July 28, 2005. Judge John Coughenour says it is possible Ressam may further help the government in its terrorism investigations. Prosecutors were looking for a sentence of 35 years behind bars because Ressam had stopped co-operating and had jeopardized two prosecutions. Ressam's lawyers were looking for a 12�-year sentence. They said Ressam is still willing to co-operate but doesn't remember as much about his alleged co-conspirators as he used to. American justice officials say Ressam will be sentenced on April 27. The sentencing had been delayed for four years while he co-operated with investigators seeking information on suspected terrorists. The White House releases a previously classified memo to President George W. Bush that he received a month before the Sept. 11, 2001, attacks. It was a warning that al-Qaeda cells were in his country and that hijackings were a possibility. The memo refers to several people, including Ahmed Ressam. The FBI questions Ressam about what he might have known about the Sept. 11 attacks on New York, Washington and Pennsylvania. Mokhtar Haouari is convicted of conspiracy to supply material support for a terrorist act, and conspiracy to commit fraud. But he is found not guilty of the more serious charge of knowingly aiding terrorists. Ressam describes a plot two years earlier to set off a bomb in a neighbourhood in Canada with "Israeli interests." Ressam testifies at the New York trial of Mokhtar Haouari, who was accused of being part of a conspiracy to bomb American targets. Haouari and Ressam were associates in Montreal. Ressam describes a plot to bomb Los Angeles International Airport on Dec. 31, 1999. Ressam describes his time at an Afghanistan training camp for terrorists where he was taught how to assassinate people, use anti-tank missiles, and build powerful bombs out of fertilizer. U.S. officials say they may offer Ressam a reduced sentence if he testifies against other members of a suspected Islamic extremist cell. Ressam is convicted on all nine counts, including conspiracy to commit an act of international terrorism. He could be sentenced to up to 130 years in prison. Judge Jean-Louis Bruguiere  described as the world's foremost terrorism expert  tells the trial that Ressam had links to Osama bin Laden. He says as early as 1996, French intelligence learned that Ressam and six other Montreal men were trafficking in fake passports that were used to send people to train as terrorists in Afghanistan. Ahmed Ressam's trial opens in Los Angeles. Prosecutors say they have overwhelming evidence that Ressam is an international terrorist. Ressam's defence team describes him as "quiet, religious and very gullible," and says that he was "used and abused" as an unwitting courier who did not know that he was carrying bombs. A trial in France hears that a modest apartment in Montreal was used as a meeting place for militants working for Osama bin Laden. Ressam had been a tenant of the apartment. Ressam is charged with nine more counts including international terrorism. Ressam asks that his trial be moved from Seattle. At the request of American officials, the RCMP arrest Mokhtar Haouari. American prosecutors say he is linked to Ressam. Documents filed in a Montreal court show he was wanted by police in Algeria because he was once involved with the fundamentalist Islamic Salvation Front. He is denied bail. Seattle cancels its Millennium Celebration in the wake of Ressam's arrest  although no threat had been received. A grand jury indicts Ressam on charges of trying to smuggle explosives into the United States. He's ordered held without bail. Montreal police say they've been looking for Ressam to determine if he was connected to a crime ring with links to Algerian terrorist groups. He was wanted on three charges. Montreal police raid the apartment Ahmed Ressam rented, as the investigation widened. Ressam is charged with bringing explosives into the United States three days after he was stopped at the Port Angeles, Wash., border crossing. He arrived in the U.S. by ferry from Victoria, B.C. He was carrying two Canadian driver's licences, each in a different name, and a Canadian passport  and 50 kilograms of explosives. Ressam returns to Montreal and meets with Haouari, who gives him a driver's licence in the name of Mario Riog. Ressam returns to Vancouver on Dec. 6 or Dec. 7 and stays with Abdelmajid Dahoumane for the next week. Ressam flies to Vancouver to gather materials and make explosives. 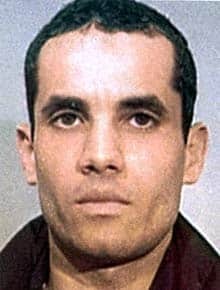 He meets with a key accomplice, another Algerian refugee named Abdelmajid Dahoumane. The two men rent a motel room and set up a crude bomb-making factory. Ressam begins working out the details of his plan to bomb the Los Angeles airport. By fall, he is building timing devices for the bomb and gathering other chemical ingredients. Ressam returns to Montreal under the name of Benni Noris. He says that he brought with him chemicals and directions for making explosives. Ressam leaves Montreal for Afghanistan. He spends several months at a camp funded and administered by Osama bin Laden. He receives training in light arms  including machine-guns and rocket-propelled grenades  the use of explosives and poison gas, methods for assassination, sabotage and urban warfare. Ressam would later testify that it was during this time that he began planning on attack on U.S. soil. Ressam misses a hearing to determine whether he should be granted refugee status. His application is denied and a warrant is issued for his arrest. Ressam adopts a new identify by filling in the blanks of a stolen baptismal certificate form with the alias Benni Antoine Noris. He obtains a Canadian passport in that name. Ressam flies to Montreal with a doctored French passport. He is stopped by immigration officials. Ressam requests political asylum claiming in a sworn statement that he had been tortured in Algeria and that he was falsely accused of arms trading and other terrorist activities. He is allowed to stay pending a refugee hearing. Ressam leaves for France, looking for work. He stays for two years  mainly on the island of Corsica  picking grapes and oranges and working at a tourist resort. Ressam fails exams that would have allowed him to go on to college after graduating from high school. He applies for jobs with police and security forces but is turned down. He works in his father's coffee shop. Ressam develops an ulcer and is sent to Paris for treatment. He gains access to books banned in Algeria that fault the country's military dictators for preventing democracy to take root. When he returns, he begins to take up the cause of militant Islamic rebels. Ahmed Ressam is born near Algiers. He's the eldest of seven children.